UPDATE (25 August 2017): This Method No longer Works. Don’t Waste your time trying. Thinking to clean up your twitter followers? Then here is the easiest method to remove all your twitter followers in bulk. I have been trying to remove all my followers for a long time, but I didn’t find any website or tool to do this work. Now I found one method by which we can quickly remove/delete all our twitter followers automatically. Why Remove all your Twitter Followers? This answer might be different from one user to another user. For me, I involved in #followback team. That means, if you follow me on twitter, then I also follow back you on twitter. This method is used to increase twitter followers count. Later I think that there is no use of increasing twitter followers if no one is engaging with you on twitter. More over, if you have a lot of spam followers or if you have a lot of bots following you on twitter, then it actually decreases yours creditably. So instead of having such followers, it is better to remove those followers. Another reason is, As I said above, I have involved in follow back team because of this I received many followers. Now I stopped following them using some mass unfollow tool. But still those users are following you on twitter. Don’t you think we are cheating those users who followed us just because we followed them? This is one of the main reason I removed all my followers. Or for any other reason, you may be thinking to start all over again. Then you use this tip to remove all your followers. What are you going to miss after deleting all your Followers? The first thing you are going to miss is, your followers count on twitter and second is some genuine followers. I really missed some genuine twitter followers on my account. I think it would be around 10% of my original follower’s count. That would be around 400 to 1000 followers. You can avoid this by manually going through the list. I will explain this later. Don’t miss: Check domain name available or not on Twitter! How to Remove/Delete your Followers in Mass on Twitter? To achieve this, I used the modified version of this code. That code is used to remove fake followers on twitter but I need to remove all my followers so I modified that code to remove all my followers on twitter. Modify that original values with changed values or you can copy modified code from here and follow below steps. Tip: Always use the code for author site to get the updated version. 6. Now click “Delete Fake followers” button to remove all your followers. 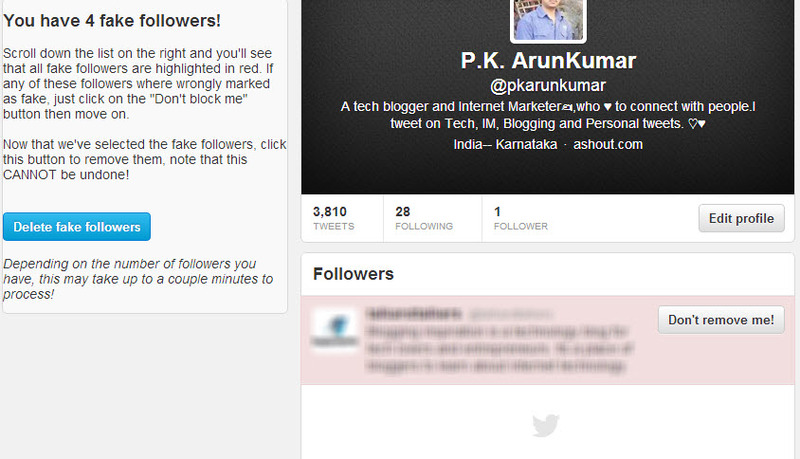 Note: If you have a large number of users following you, then it will take some time to remove all those followers. To check how many followers it has removed, just open a new tab and visit your followers page. You will see followers number decreased if it is removing your followers. This doesn’t work. Can you fix it? I’m sorry dude.. I took code from another site and modified little that’s it. You should contact that site owner to fix that issue. Your way didn’t work with me at all. I think it’s already out dated now. Hello Arun, can you write a code where we can put the name of certain @s (multiple) and have a button to block them all in 1 Go ?